One of the most recognised English language nursery rhymes is the famous Oranges and Lemons. The rhyme works its way through a number of famous old London churches and I’ve often wondered where those churches were. 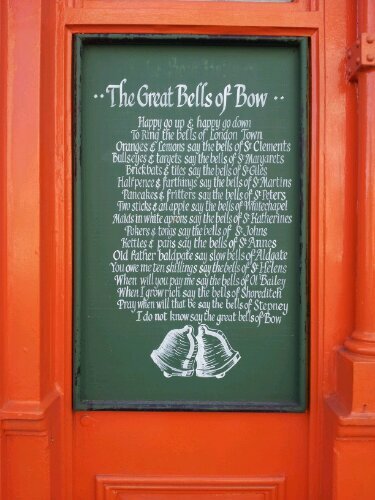 Every morning I walk past a pub called the Bow Bells which is a great, traditional, quite earthy east end boozer painted bright orange and with the full nursery rhyme written outside stuck to the wall on a green board. The pub is also just down the road from ‘Bow Church’ which is thought by some to be the location of the ‘Great bell of Bow’. This is the last bell to be mentioned in the nursery rhyme. Unfortunately for Bow Church however the common consensus has it that the real location of the Great Bell of Bow is actually at the St Mary le Bow church on Cheapside in the city which is about 3 miles the other way. Bow church though is old enough to have been around when the rhyme was written and its bells would certainly have been heard by many. But then that’s part of the fun of the nursery rhyme. What does it mean and where did those lines come from? The words were written at a time when London was very different and the churches of the city would have been utterly dominant not only in terms of their impact on the skyline but in terms qof their influence on social life as well. In terms of genealogy it appears that the first recorded version of the rhyme appeared in 1744 but not in the form that it is known now. Prior to that it is likely that it will have been well known and there is evidence that a dance known as oranges and lemons dates back to 1655. So let’s go through the rhyme, the rest of this blog post will look at the churches, where they are and what the words refer to. There are lots of theories about why the song was written in the first place and a quick search of google will come up with loads of them. My favourite is that the the rhyme simply developed over time as a means to remember the different areas of London which will have been defined by their churches. So onto the rhyme and in homage to the Bow Bells pub, the version I’ll be using is the version written on the outside of the pub. To ring the bells of London Town’. St. Clements Church on Eastcheap is where we start our journey. There is some debate over whether the true ‘oranges and lemons’ church was here or St. Clements Dane in the Strand. It would seem however that the majority of opinion places the iconic bells here on Eastcheap. The oranges and lemons of the song refer to the cargo that would have been offloaded close to the church when the Thames was a lot further in than it is today. In the heart of the city and next door to the bank of England, St Margaret Lothbury sits unobtrusively amongst the buildings around it. The church was burnt down in the great fire but rebuilt by Sir Christopher Wren in 1690. It is thought that the bullseyes and targets refer to the fact that archery was practised in fields nearby. Bang in the heart of the Barbican, St. Giles looks striking against the brutalist backdrop of the Barbican high rises. The reference to brickbats and tiles are thought to refer to materials used by builders nearby. As a church its probably also one of the most interesting. Oliver Cromwell was married here. Sir Martin Frobisher, John Speed and John Milton are buried here and Ben Johnson, John Bunyan and Daniel Defoe were baptised here. St. Martins Orgar on Martin Lane was pretty much destroyed in the Great Fire of London leaving only the bell tower which is now occupied by a firm of solicitors. It is thought that the reference to halfpence and farthings is a nod to the money lenders who operated in the area. The line of the rhyme is sometimes better known as ‘you owe me five farthings’. St. Peters on Cornhill is hard to spot, hidden as it is amongst a few tiny alleys. From Cornhill itself it doesn’t look like much at all so obscured is the frontage. It is thought that the pancakes and fritters in the rhyme refer to the types of food that were sold nearby. Cornhill after all was the site of a corn market that dated back to the Roman era. Like many others the church dates back a long time but was destroyed in the fire of London and then rebuilt by Sir Christopher Wren. The only part of the rhyme that doesn’t refer to a church is the bells of Whitechapel. This is because it was the Whitechapel bell foundry in which the bells of London were forged. Amazingly it is still operating today with the likes of the Liberty Bell and Big Ben on its resume. The origin of the ‘two sticks and an apple’ is hard to agree upon although it could be to do with the shape of the hand bells produced at the foundry which might have resembled toffee apples. St. Katherine Cree dates back to 1108 and takes its name from an abbreviation of Christ church. It actually survived the great fire of London although it destroyed a lot of Leadenhall market which was nearby. The ‘maids in white aprons’ are thought to refer to the costumes of women working in the market selling meat, fish and poultry. St Johns chapel is the oldest church to be featured in the rhyme. It is located within the white tower of the famous Tower of London. It is thought that the pokers and tongs referred to might have something to do with the methods of torture used on prisoners in the tower. Now knowns St Annes Lutheran Church, it nestles up next to the remains of the old Roman fort and near to the old London Wall. It was destroyed in the great fire but then rebuilt by Wren. It then was hit in the second world war by a bomb and had to be rebuilt once more. The kettles and pans in the rhyme are thought to refer to the utensils from the local coppersmiths who worked in the area. St. Botolph without Aldgate is on the edge of the city and at one point became known as the prostitutes church because it was here that they would solicit their wares. It is thought that the reference to old father baldpate relates to st botolph who apparently had a bald head. Another interpretation however links old father baldpate to the prostitutes of the area with old father baldpate meaning something else entirely. St. Helens Bishopsgate can be found directly underneath the imposing landmark of the Gherkin. It is thought that the ‘you owe me ten shillings’ refers to a former lord mayor of london called John Spencer who had a notorious reputation as a money lender. The bells of Old Bailey are actually the bells of St. Sepulchre without Newgate which is opposite the Old Bailey, the site of which stands on the former Newgate prison. The bell of St. sepulchre rang out during executions. It is thought that the phrase ‘when will you pay me’ refers to the debtors interred at Newgate. St. leonards in Shoreditch was located in the old theatre district of London and frequented by actor types. Shakespeare had his first theatre nearby and Richard Burbage a contemporary of his from the time is buried there. The area itself was very poor and it is thought that the phrase ‘when will I grow rich’ refers to the hope of riches that the inhabitants of Shoreditch must have had. St. Dunstans of Stepney was an important church for mariners and is one of the oldest churches in London. it is possible the the phrase ‘when will that be’ might refer to the hopeful wishes of loved ones wondering when their sailor sons or husbands would be coming back from sea. Probably not the church referred to in the nursery rhyme but Bow Church is historic and situated just on the old border with Essex, next to the old Bow Bridge which crossed the River Lea. It would have been the next church on from St. Dunstan’s in Stepney and would have been notable at the time for being at the edge of the city’s limits. Another option and what is certainly the location of the famous Bow Bells which, if born within the sound of them, make you a true Cockney. The great bell of Bow could also refer to the principal curfew bell that was located in the church and rung each day at 9pm. The rhyme has obviously changed throughout the years but still retains its echoes of yesteryear remembering as it does the areas in which the churches stood and what defined them. Previous The Rolling People paint the Village Underground wall. Really great blog post. I have been working on a detailed post on ‘the Bells of Old Bailey’ – one day! Its the largest parish church in London and is quite unique in many ways. Thanks I’m glad you liked the post, the bells of old bailey idea sounds great. I will look forward to reading it, there must be so many stories those bells have to tell. The links you have left appear to be totally useless as neither of them contains any extra information as I expected. Great blog. ‘pokers & tongs’ at the Tower of London, will in all likelihood refer to the monarch’s armoury which would have been based there. An incident with a poker and a King happend in another castle out of the City!